Very excited for dear friends presenting new works. Susan O’Malley and Leah Rosenberg (by invitation of Montalvo Arts Center). Find your center and then get a little de-centered at their event-specific cocktails on July 24, from 6-8pm. 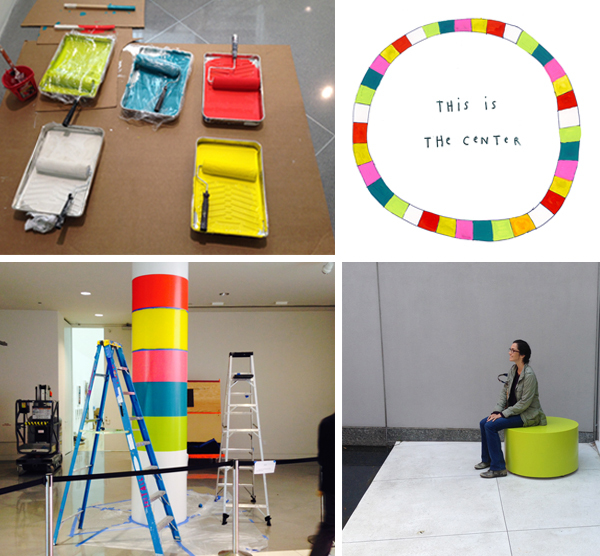 Susan O’Malley and Leah Rosenberg, installation of Find Your Center, Montalvo Arts Center at ybca. Source: Susan and Leah. Each of these 50 new art works are constructed using on-the-job materials informed by vantages of the preparator — behind the painting, during the paperwork, inside the crate, from truck to office to gallery — that happen between, in proximity to, and in spite of the finished exhibition. In the collaborative spirit of the profession, BAAWA will present works generated by preparators with a strategic focus on the collective work of a community rather than one single author. I really wished that I could have attended the Tate Modern’s No Soul For Sale fair of alternative and artist-run spaces, so when I heard that BAN7’s distributed curatorial model was inspired by NSFS, I was intrigued. The featured organizations cut a broad cross-section of the Bay Area art scene. In fact, I’m not familiar with some of them—either they’d begun around or after I left SF for NYC, or they were in entirely different networks. For a scene as small and tightly-knit as the Bay Area, this chance for BAN to present new spaces, artists and ideas is really exciting. It’s easy to knock bi- and triennials, but when the curatorial authorship reflects smaller art organizations, I hope audiences attend with a more open mindset. Ripple effects of negative affects and positive actions from the San Francisco Bay Area. —Walter Robinson, as quoted by Christian L. Frock, “Priced Out: San Francisco’s Changing Values and Artist Exodus,” KQED Arts, April 3, 2014. Edward Ruscha, OOF, 1962, Oil on canvasDimensions, 71 1/2 x 67″ // Source: Moma.org. Michele Bock // Source: arts.berkeley.edu. …ARC will present Valuing Labor in the Arts: A Practicum. This event will include a series of artist-led workshops that develop exercises, prompts, or actions that engage questions of art, labor, and economics; it will also include a series of commissioned writings by critics and researchers whose work focuses on artistic labor and cultural economies. …ARC will host artists, curators, and writers from the Bay Area, Los Angeles, New York and Chicago, to stage an intimate yet wide-ranging exploration about art and labor, about alternative economies in the arts, and about strategies for working in ever changing “art world” landscapes…. And…. I’m thrilled to help promote the Bay Area Art Worker’s Alliance‘s call for participation, for preparators, art installers, and art handlers to contribute to an exhibition in YBCA’s Bay Area Now triennial. These invisible roles in the making of art exhibitions, which are on-call, part-time, financially and sometimes physically precarious, are finally getting some much-needed recognition from this institution. Deadline: May 15. Spread the word!